A Florida city is officially recognizing local affiliates of two leading national organizations at its meeting this evening. 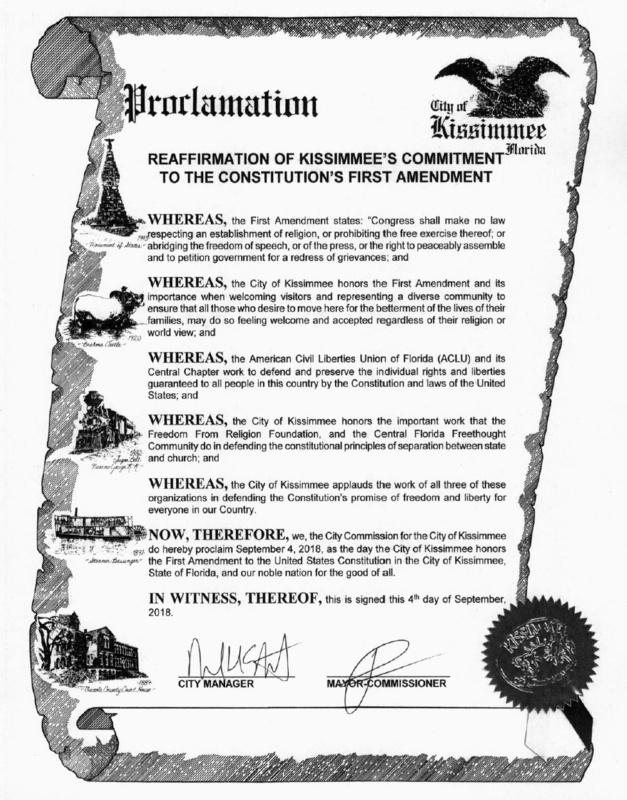 The Freedom From Religion Foundation’s Florida chapter, the Central Florida Freethought Community, the ACLU of Florida and its Central Florida chapter are to be honored by proclamation at the Kissimmee City Commission meeting 6 p.m. today (Tuesday, Sept. 4). This is in response to complaints from the organizations that prompted the city to revise its prayer proclamation last month. In August, the city declared “40 days of celebration of life, love and family” and announced a call to prayer event scheduled for Aug. 21. The proclamation, the ceremony at the commission meeting and the photos released for the event had the appearance of city sponsorship and endorsement. After the organizations and others complained, the city said it was not their intention that the “city officials’ actions and comments were interpreted as promoting a religious message and advancing religion over nonreligion.” The city also distanced itself from the prayer event in a city-owned park, stating that it wasn’t a sponsor and had not used city resources to promote a specific religion. WHEREAS, the City of Kissimmee applauds the work of all three of these organizations in defending the Constitution's promise of freedom and liberty for everyone in our country. The nonprofit groups will also conduct a presentation for the Kissimmee City Commission on the importance of the First Amendment’s Establishment Clause and the separation between state and church. Central Florida Freethought Community Director David Williamson will be invoking the words of both Presidents Reagan and Kennedy to stress the need for government to remain resolutely secular. The Freedom From Religion Foundation is elated at the official recognition being accorded to its local chapter and the Establishment Clause. “We are delighted that the city of Kissimmee is providing some equal time and recognition for secular groups and the importance of separation between government and religion,” says FFRF Co-President Annie Laurie Gaylor. The Freedom From Religion Foundation is the nation's largest association of freethinkers (atheists, agnostics), and has been working since 1978 to keep religion and government separate. With more than 32,000 members and several chapters all over the country, including 1,500-plus and a chapter in Florida, the organization also educates the public about nontheism.